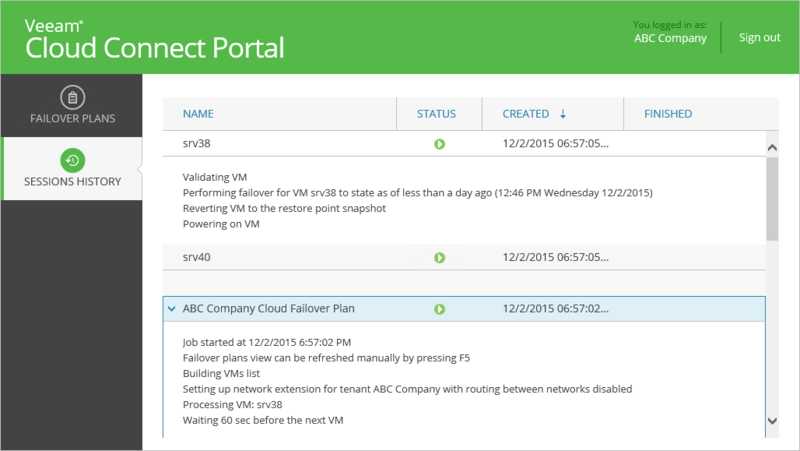 With Veeam Cloud Connect Portal, you can monitor the failover plan execution process as well as view results for finished failover tasks. Every run of a cloud failover operation and VM processing initiates a new session. When you start or undo a cloud failover plan, the Sessions History section automatically opens. You can also access the Sessions History section manually at any time. The summary information in the Sessions History section provides the following data: cloud failover plan and VM replica status, date of failover task start and finish. You can also view detailed information on every VM processing and cloud failover plan session. Log in to Veeam Cloud Connect Portal and open the Sessions History view. In the working area, double-click the necessary cloud failover plan and/or VM processing session. To quickly find the necessary session, you can sort sessions by name, status, creation or finish date. To sort sessions, click the corresponding column heading at the top of the working area.